Petra (known as “The Rose City” due to the rose colored stone that it is carved from and “The Lost City” because it was, well, lost for hundreds of years) is one of the “New” Seven Wonders of the World and a UNESCO World Heritage Site. 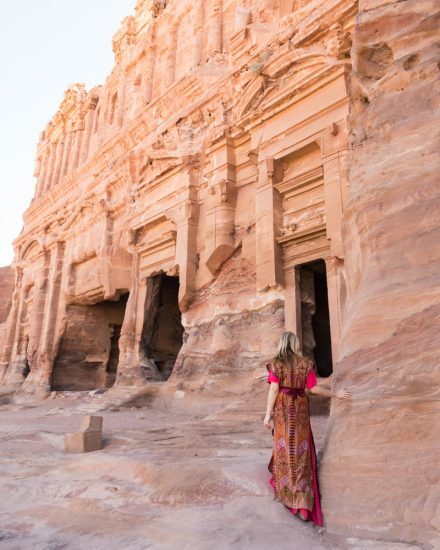 Dating back to the third century BC as the capital city of the Arab Nabataeans, Petra was home to some 20,000 Nabataeans at it’s peak, and is today one of the most visited tourist destinations in the world! It was also chosen by the Smithsonian Magazine as one of the “28 Places to See Before You Die”. The ruins of Petra are a majestic archaeological wonder to behold – not just because of their massive size and intricate designs – but also to consider exactly how they were carved. You can see small etch markings lining the sheer rock face of the Treasury and imagine men precariously perched 120 feet up, painstakingly scratching away at the sandstone. Site excavations have been ongoing since the early 1900s and over 800 monuments have been identified and listed, but surprisingly archaeologists have explored less than half of the site to date! 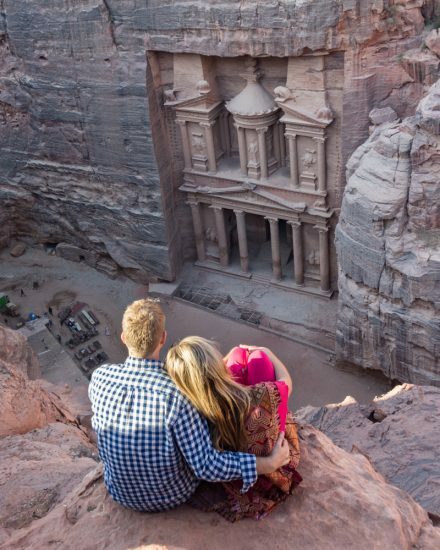 If seeing the spectacular ruins of Petra isn’t already on your Bucket List, it should be! And we’ll help you get there. 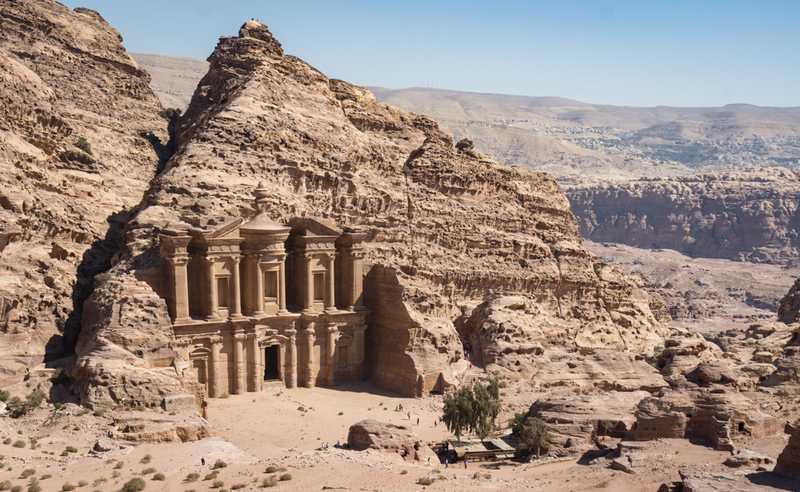 How long you need to see Petra, where to stay, how to buy tickets – just follow this complete guide to Petra, Jordan and you’ll be sure to uncover all that the Lost City has to offer! 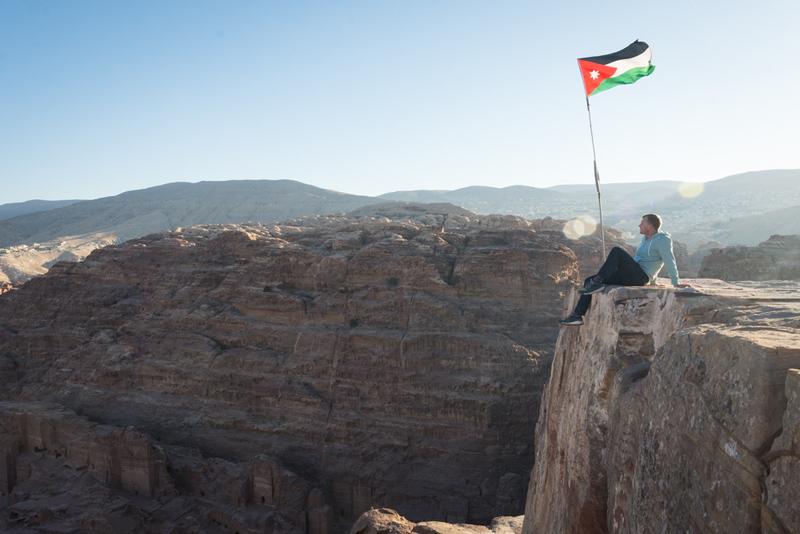 The closest city to Petra (and where you’ll need to book your accommodations) is Wadi Musa. From Amman: There is one JETT bus daily at 6:30am to Wadi Musa. If you prefer to travel the local way, there are several minibuses that depart throughout the day (when they are full) from the South Bus station. Most taxi drivers in Amman don’t speak English so ask someone at your hotel to write it down for you in Arabic. You can also take a taxi all the way from Amman to Petra for around 70-100 JD (be prepared to bargain hard!). From Aqaba: There are many JETT buses departing from Aqaba to Wadi Musa daily. Click here for a complete schedule. Petra is open year-round although tourists flock to the area during the spring and fall when temperatures are mild. Summer can be unbearably hot and January and February are the coolest months and get occasional rain. Regardless of the time of year that you visit, the high elevation means that evenings are chilly so don’t forget a sweater! When it comes to booking a hotel in Wadi Musa be sure to consider location, location, location! 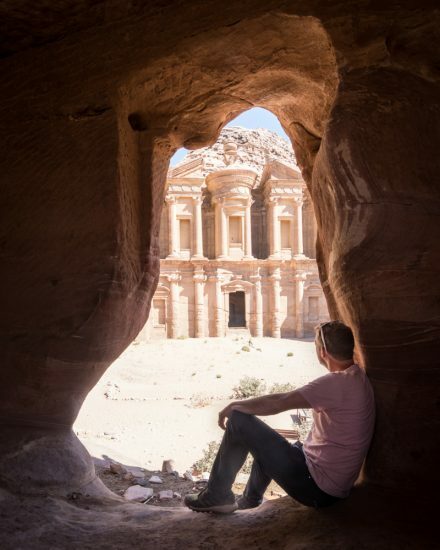 You’re here to explore Petra and if you follow our itinerary you’ll be starting every morning bright and early so proximity to the Petra gate is key to getting some additional zzz’s. 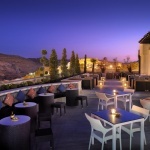 Mövenpick Resort Petra – If you’re looking for the best of the best accommodation that Wadi Musa has to offer then the Mövenpick Resort Petra should be at the top of your list. 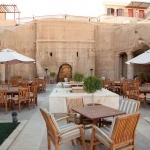 It is a luxurious 5-star hotel located directly across the street from the entrance to Petra. Gorgeous rooms, a picture-perfect pool, and spectacular city views await your arrival. You’ll love relaxing by the pool after your long, exhausting morning spent exploring the Lost City. Petra Guest House Hotel – The only way you can stay closer to Petra is to snuggle up with a Bedouin in their cave – Petra Guest House Hotel is actually inside the Petra site! Sadly they don’t offer a pool, but the giant breakfast spread, awesome cave bar, and unbeatable location more than makes up for it. Make sure you reserve early as this hotel books up weeks in advance. Petra Palace Hotel – The best bang for your buck in Wadi Musa may be the Petra Palace Hotel – you’ll still be a short 2 blocks from the entrance to Petra but at a fraction of the price of the other two options mentioned above. The rooms are large but a bit dated but for the price you really can’t beat it! When you’re not wandering (sweating) around Petra you can escape the heat with a dip in their lovely pool. For a fun and lively atmosphere and Western food in a cave (!) try Cave Bar in the Petra Guest House Hotel right in front of the gate to Petra. For delicious authentic Jordanian food, great prices, and the friendliest staff, check out Beit Al-Barakah Restaurant. For a fun evening, why not take a traditional cooking class? Contact The Petra Kitchen to get it scheduled. At the time of writing (October 2017) the conversion rate in Jordan is about 1.4 USD to 1 Jordanian Dinar (JOD) and 1.2 EUR to 1 JOD. We’ll be referring to currency in Jordanian Dinars so be sure to convert accordingly when budgeting for your trip! 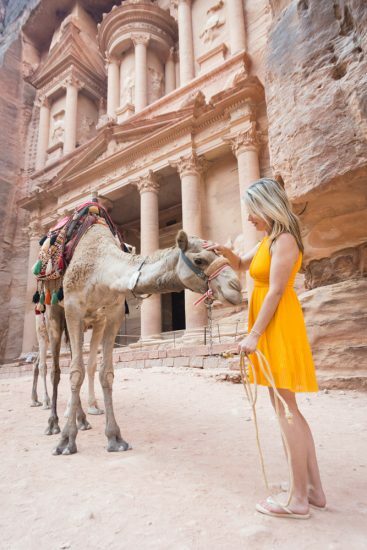 While most of Jordan is incredibly conservative and women are expected to cover their shoulders and knees, Petra is a tourist destination so most of the visitors dress in typical hot-weather Western attire. Check out all of our Tips for First-Time Travelers. Your 40 JOD visa to enter Jordan if you purchase the pass prior to entering the country and stay a minimum of three nights (4 days). Entrance to 40 tourist attractions in Jordan. But the most popular (and expensive) sites that are included are Petra, Wadi Rum, and Jerash. Is it worth it? Yes! If you do just simple math and add up the cost of your visa (40 JOD) and the cost of a 1-day pass to Petra (50 JOD), you’re already at 90 JOD and the price for the Jordan Pass would be 70. So you’re already saving 20 JOD. But plan to try to purchase at least a week in advance of your trip as their website can be persnickity. We were frantically attempting to purchase ours in the airport before our flight and kept getting errors so unfortunately we weren’t able to actually obtain one. Gate opens at 6:00am and visitors are asked to leave right after sunset. Petra by Night begins at 8:30pm and ends at 10:00pm. Siq – a narrow gorge. The main entrance to Petra is through a Siq that was formed by a natural geological fault split apart by tectonic forces (as opposed to water erosion). There are several other “siq” hikes in Jordan. Nabataeans – the nomadic Arabs who built and inhabited Petra. They were known for their ability to carve structures into solid rock and also for their efficient water-collecting methods to create an artificial oasis in barren desert landscapes. Bedouin – the Al B’doul Bedouin tribe claim to be descended from the Nabataeans. 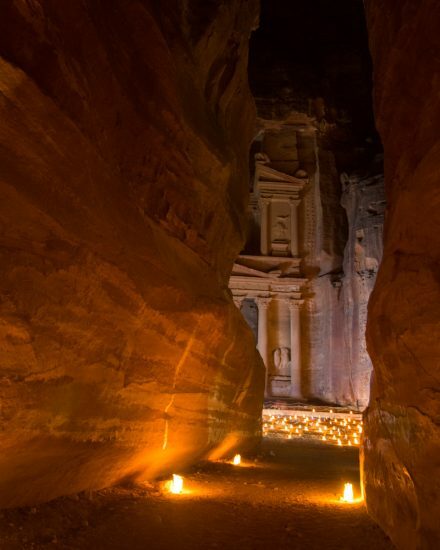 The Bedouin people have lived among the caves and tombs of Petra for over 170 years but were forced to move to the nearby settlement of Umm Sayhoun when Petra became a UNESCO World Heritage Site in 1985. Today they travel to Petra (many appear to continue to sleep within the site) everyday to sell their wares, act as tour guides, and entertain tourists with camel and donkey rides. Sandstone – the rose colored stone from which Petra has been carved. Dating back to the third century BC, Petra was the capital city of the Arab Nabataeans, home to some 20,000 Nabataeans at it’s peak, and later occupied by the Romans. Controlling commercial trade routes that passed through it, Petra became a major trading hub for frankincense, myrrh and spices and flourished. The addition of sea-based trade routes and a crippling earthquake in 363 AD led to the downfall of the city which was eventually abandoned. By the middle of the 7th century Petra was largely deserted and was a “Lost City” to all except the local Bedouin people who moved into the abandoned ruins. 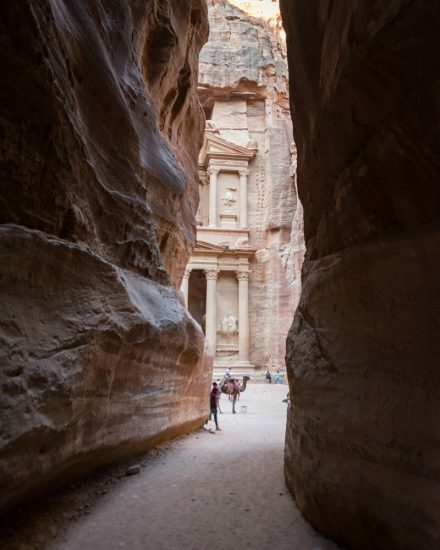 A Swiss explorer named Johannes Burckhardt rediscovered Petra when he posed as an Arab and found a Bedouin guide to take him inside. Excavation began and more and more structures continue to be unearthed to this day. A lot of dust. Your feet and the bottoms of your legs will be covered in it. Shoes are highly recommended. Extreme heat. You can buy water from loads of vendors throughout the park but you should be sure to pack sunscreen. A hat or a sunbrella would help as well. Trash. We were surprised that such a beautiful, protected (and expensive) area would be covered in so much trash. Just remember that the Bedoin people actually live in many of the caves here and it’s probably very difficult to properly dispose of all the waste that is generated. A variety of smells. While there are several toilets available throughout the park, it seems that many people prefer to urinate (and worse) in the caves that you’ll be exploring throughout your time here. Be prepared for a stinkfest and be careful where you walk when you’re inside. Bedouin people trying to make a dinar. You can’t walk more than 20 feet without a local offering you a camel or donkey ride or a “locally made” good for sale. Be sure to ask the price before accepting a ride or taking a photo with one of the locals that is clearly dressed for a photo op. A clash between the Bedouin people and the local guards. While the park has plenty of rules that tourists are expected to follow, it seems that pretty much anything goes for the Bedouin people. For example, there is a hike off to the left of the Treasury that clearly has a sign saying “no entry” but you’ll get offers from Bedouins to take you up for a fee (we paid 10 JOD but the price started at 25). But if you get caught by one of the guards while going up or coming down you’ll get a scolding (just tell them you are coming from The High Place of Sacrifice). You’ll also likely get offers to stay overnight in a cave although the official rules clearly state that it is forbidden. Al Khazna (aka “the Treasury”) – the first ruin that you will see once the Siq opens up. It is the most famous and photographed ruin in Petra. Ad Deir (aka “the Monastery”) – one of the largest and best preserved monuments in Petra. The hall was later converted into a Christian chapel and crosses were carved into the rear wall. There are 800 steps that must be climbed to see the Monastery and the trip is exhausting but worth it so opt for a donkey ride if you don’t feel comfortable making the trek. The Royal Tombs – four amazing facades adjacent to each other that are considered to be tombs but were likely used for a variety of purposes. The tombs include The Urn Tomb, the Silk Tomb, Corinthian Tomb, and Palace Tomb. Basin Tent and Nabataean Tent are both restaurants offering hot food. Water, tea, coffee, soft drinks, and juice are offered at multiple tents throughout the park. Prices generally range from 1-2 JOD per drink. Most hotels offer a “boxed lunch” for a small price that includes a sandwich, juice, fruit, and other snacks and can be available for you to pick up at the front desk at any time that you request. Plan to arrive to the park just before 6:00am to purchase your 2-day ticket (if you have the Jordan Pass you can head straight to the gate). Don’t be surprised if the ticket attendant is a few minutes late. Shortly after you enter the site you’ll be greeted by several men offering you a horseback ride to the Siq. Technically this ride is free but you’ll be expected to tip the man leading the horse around 5 JOD and the hike in is rather short, about a mile from the gate so we didn’t see very many people taking advantage. The walk into Petra is at a slight downhill incline which is lovely on your walk in but exhausting on your walk out. Take your time along the trail and be sure to look around you while you walk – you’ll notice many small ruins all along the way. Also note the natural aquaducts lining the trail that supplied the city with water. The canyon walls of the Siq will narrow and soon the magnificent Treasury will come into view. This magnificent structure was originally built as a mausoleum and crypt but the Arabic name Treasury derives from several legends involving pirates and treasure. Also fitting as it was featured as the final resting place of the Holy Grail in the movie Indiana Jones and the Last Crusade. Even though you’ve gotten an early start, there will no doubt already be a few people here taking photos. Take your time here getting the shots you want, it only gets crazier as the day progresses. Once you’ve had your fill of the Treasury from the ground, it’s time to head to the top of the mountain behind you to check out the views from above. Walk straight there – this hike is 2.2 miles and steep so it is better to do early to avoid the mid-day heat. The map from the Visitors Center shows that the Al-Khubtha Trail requires a guide but it’s easy to do on your own. It is well marked and highly trafficked so you should have no issues finding the “World Best View” tent at the very top (which you’ll come to immediately after the tent touting “The Best View” – it’s not). The owner is a super friendly guy and this tent is his livelihood so buy a delicious (cardamon) coffee and soak in the views right on the edge of the cliff! After taking way too many photos of the Treasury from above and enjoying your coffee break in the shade, head back down the same way you came. Explore the ruins that you passed by on your rush to get up the mountain. The Royal Tombs are four amazing facades adjacent to each other and include The Urn Tomb, the Silk Tomb, Corinthian Tomb, and Palace Tomb. The Silk Tomb is easy to spot as from the rich, dramatic color of the sandstone. The Street of Facades turns into the Colonnaded Street and you’ll stroll along both to see the Theater (which could seat 3,000 people), the Market Area, and the Great Temple. But don’t start the long trek up to the Monastery just yet, save that exhausting hike for tomorrow. You’ll likely be done by the early afternoon so head back to your hotel for a much needed siesta and a dip in the pool! If you plan to come back later in the same day, be sure to mention it to the men at the ticket booth so they will remember you. Again, start your day bright and early at 6:00am. As you probably noticed yesterday, the early hours of the morning in Petra provides cooler temperatures and less crowds making the entire experience significantly more enjoyable. After again oooing and awing at the Treasury, walk down the Street of Facades to the sign on the left pointing you in the direction of the High Place of Sacrifice Trail. 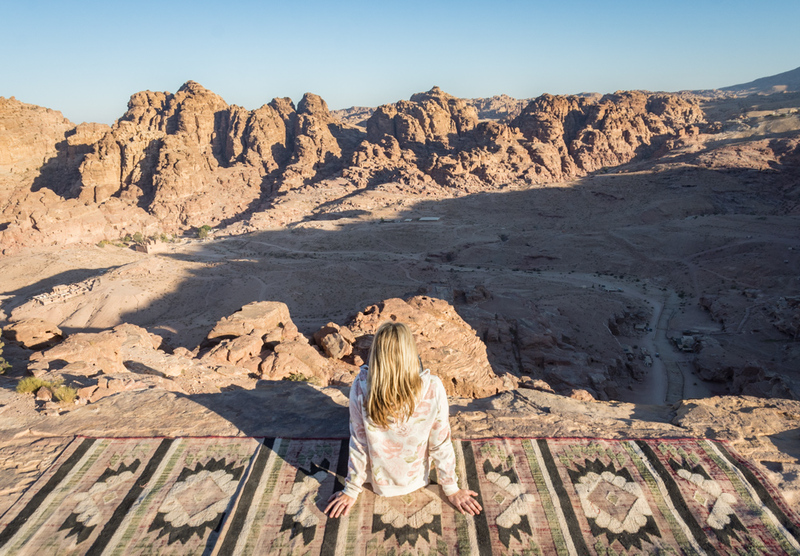 The High Place of Sacrifice (al-Madhbah) is one of the highest accessible view points in Petra and offers spectacular views of the ancient city 560 feet below. The purpose of this place was for religious ceremonies and possibly even human sacrifice. Rather than turning back the way you came, continue to the steps leading off the back of the mountain into Wadi Farasa which turns the hike into a 2-hour loop ending at the Qasr al-Bint at the base of the Monastery Trail hike. This loop hike will take you by far less trafficked architectural wonders that most tourists miss during their visit. However before you begin your descent into the valley below, take note of the two obelisks that instead of simply being placed there, the entire side of this mountain-top was leveled around them to leave them sticking up. An amazing (and seemingly unnecessary) undertaking to say the least. They most likely represent the two chief male and female Nabatean deities; Dushara and Al-Uzza. Along this loop trail take note of the Lion Monument carved into a wall along the stairs which likely served as some sort of fountain with water flowing out of it’s mouth. 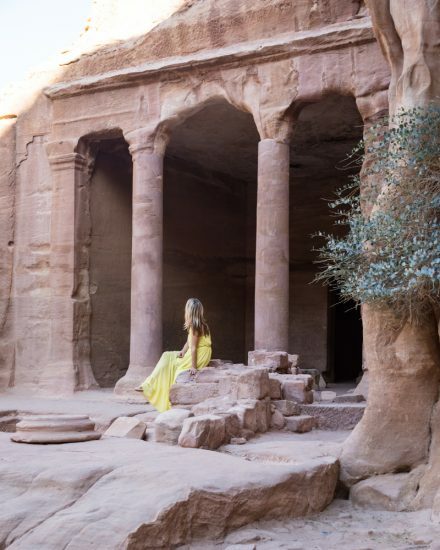 You’ll also see the Garden Triclinium, the Roman Soldier Tomb, and a tomb that lacks a decorated facade but has a uniquely carved interior – this is not common for other Petra tombs and the reason for it is unknown. Once you reach the Great Temple and Qasr al-Bint you’ll continue on up the Ad-Deir (Monastery) Trail. You’ll be climbing around 800 steps to reach the top so if you are feeling weary you can opt for a donkey ride from one of the many touts wandering around at the base of the trek. There is a tent offering beverages and snacks with a prime view of the Monastery if you want to rest your feet at the end of this grueling hike. If you have more energy, head up to the “View” tent on the mountain above you for a tea and a chat with a sweet Bedouin teenager and views of both the Monastery and the canyon below. You’ve had a long day of hiking! If you’ve missed anything in the past 2 days or have any last minute souvenirs to purchase, do it all on your way back to the Siq. Offered Monday, Wednesday, and Thursday nights starting at 8:30pm and ending at 10:00pm. 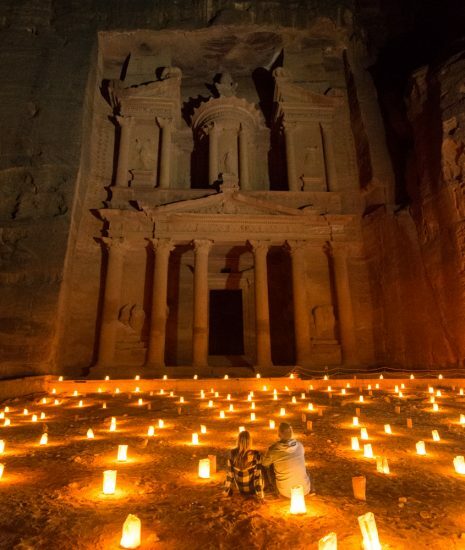 Petra by Night is not included in your ticket to Petra and costs an additional 17 JOD per person. You do not need a reservation to attend Petra by Night as there is no cap on the amount of people allowed in on any given night. To give you an idea of what to expect, I am going to recount our experience during Petra by Night. Keep in mind that we visited during the month of October which is considered high season in Jordan and there were probably 300 other people in attendance that evening. We saw a video in the Visitors Center that made it appear that the first people to get to the Treasury would be seated on the sand in the front row and then subsequent visitors would sit in rows behind. So we assumed that if we got in first-ish, we’d get the best views of the Treasury lit up by the candles scattered in front. So we decided to begin waiting in line at the gate entrance at 8:00pm to ensure a good spot. When we arrived there were no others there but shortly after the throngs of tourists began to arrive and by 8:15pm the line was massive. At around that same time the “guide” began leading the mile trek to the Treasury after tickets were checked. The walk to the Treasury was strange indeed. We started at the front but after 10 minutes or so we began being passed by eager photographers charging ahead (ignoring the instructions from the “guide” to walk two-by-two behind him). It felt like we were all in a sort of run/walk/elbow-your-neighbor-out-of-the-way for the entire mile and I seriously doubt that any of us enjoyed the candle-lit walk. By the time we emerged from The Siq we grabbed a spot on the carpet in the front row right next to a photography tour that had already been there for about 30 minutes. We were pretty excited that we had such a great spot – right in the middle with an unobstructed view of the Treasury! After about 5 minutes of fiddling with our camera settings and snapping a few photos we noticed that our “guide” began shuffling the late arrivals into the center of the candles – thus creating several rows of people right in front of us! So much for arriving early to get the best seat… the best seats actually went to those to got there late and probably didn’t have a frantic walk from the gate. We then had about 20 minutes of picture taking time while the “guide” yelled “no flash!” over and over again before the start of the show. The show consisted of a long flute (or something resembling it) performance and then an unintelligible story from the “guide” that ended in asking us all to close our eyes and make a wish. When we opened them, the Treasury was lit up in colorful spotlights – perfect for cell phone selfies but not great if you are there for photography purposes. We were all allowed “free time” to get up and roam around to take photos. They also opened up the souvenir stand nearby in case anyone was in urgent need of a new scarf or Treasury-shaped trinket. People started slowly filing out and finally, at 10:00pm they turned off the strobes (but not the florescent lights from the souvenir stand). We finally had our chance to snap some photos! But also at 10:00 on the dot they started yelling that the show was over and that everyone needed to leave. We were lucky that the photography tour stuck around and we set up the camera near them and kept telling the aggressive cleaning crew “just one more photo, just one more”. Finally at 10:15pm we had no choice but to start the trek out. Were we able to sneak in some amazing photos? Yes. Would we ever go again? No. Don’t skip the other amazing cities and ruins that Jordan has to offer! This is one the most detailed and well written posts on Petra and brought back my own memories of the ancient Nabatean city. I could only visit the ruins twice, but I am itching the get back and explore even more…there are so many facets to Petra. 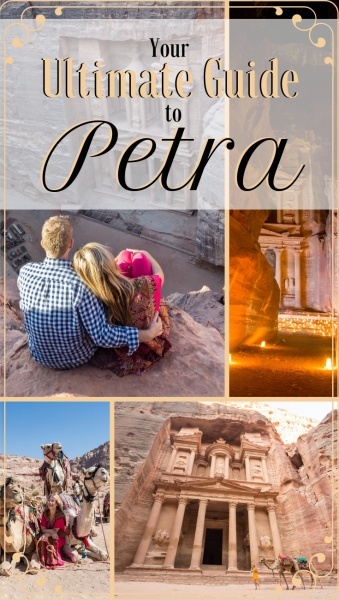 Petra is most certainly on my bucket list, and this is a great blog for everything I need to know about it. I had no idea there was a Jordan card, which I would definitely get. Does it include Petra by night? That one particularly appeals to me. But I guess I should see it by day and night. That candlelight walk looks magical (except for the photographers getting out of line). Interesting that you wouldn’t want to go back, but I can understand how this would be a one-visit attraction. I can’t wait for my visit. Petra has always been high on my bucket list. This is one of the most comprehensive posts on Petra I’ve seen, I love all the tips on different sites and viewpoints as well as practical tips. Your pictures are stunning. Petra is super high on my bucket list. I missed out on an archaeological field school opportunity in Jordan and it’s something I’ve always regretted. Thank you so much for the truly ultimate guide to Petra. It’s too bad that no one was able to enjoy the candlelit walk out, but I can totally understand that! Thanks for such an in-depth guide. This has always been high on my bucket list, and especially now that it’s been added as one of the wonders of the world! I would definitely love to get those great photos without people being in the background. Is that best to do first thing in the morning (at like 6am)? Such a beautiful place, I would love to get those amazing photos (even if it means dealing with some less than pleasant smells)! This is such a very comprehensive post! Totally worth bookmarking. I have heard about Petra from so many of my blogger friends, and I agree, it’s definitely bucket list destination. I love your pic at the Al-Khubtha Trail overlooking the Treasury. You chose well with regards to the color of your dress. I love the contrast! I was cautious about what lies ahead after spotting “ultimate” in the title. I lost count to the endless stream of ultimates in my travel related reading. Is this THE world of the year among authors? Unfortunately, some writers use it too liberally diminishing its original value. Thus, I was pleasantly surprised in this particular case. Definitely, the word ultimate is fully applicable here. As a long-term traveler, I often get frustrated with how difficult to find practical information about even the most well-known places. Opening hours, how much tickets cost, what’s included and what extra expenses to expect. I really appreciate finding all necessary information about visiting Petra in one place. 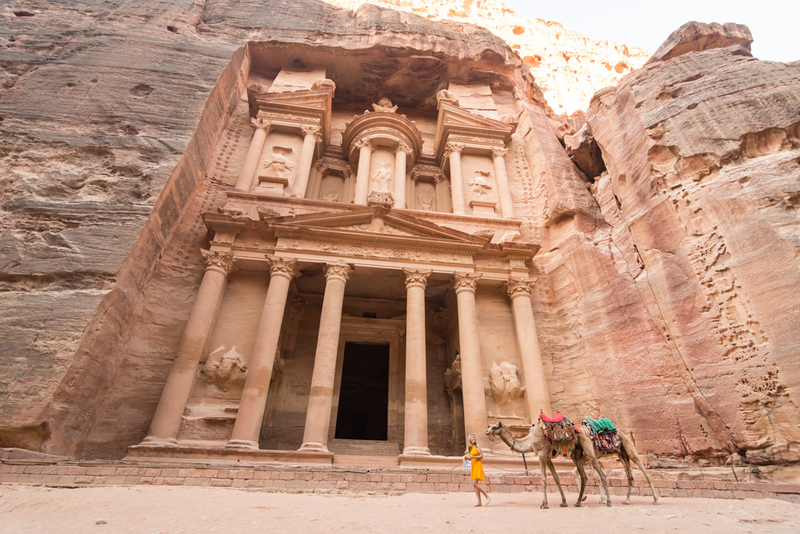 I would love to visit Petra – truly is an archaeological wonder to behold! 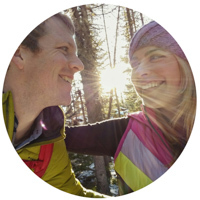 Thanks for the tip on traveling with a sweater regardless of the season – I’ve found the higher elevations can be quite chilly too. Mövenpick Resort Petra sounds like the ideal spot to set up base. Thanks for the tip too on the Jordan pass – always good to take advantage of savings where possible! I really can’t wait to explore, and while I’m excited about the whole experience, “The Best World View” tent at the top of the Al-Khubtha Trail is the view / photo opp I’m going for! This post has been extremely helpful in getting a full perspective on Petra. I know know why one should devote a few days to exploring the city and its amazing monuments, What a great viewpoint from Al-Khubtha trail! I’m sure it would be getting very very busy. Great Petra guide. I missed the place of high sacrifice. But loved the Monastery and treasury overlook hikes. I had a totally different experience at Petra by Night and found it totally magical. We arrived a little later and didn’t rush down the siq and hung towards the very back wall to take pics the entire time. I loved that they served tea. In the middle I also took my Tripp’s into the siq and took pics looks towards the treasury. I felt alone with the sound of the flute and it was almost spiritual. Great write up though!